Comet ISON swept through its perihelion within 1,165,000 km of the Sun’s surface at about 18:38 GMT on 28 November, but did it even make it that far in one piece? There have been signs that its brightening was halting again and perhaps that its icy nucleus might be breaking up even before it encountered the extreme heat and tidal forces of perihelion. In my view, sensationalist claims that ISON would be the Comet Of The Century, visible in broad daylight and an unmistakable spectacle in our night sky, are about to be proved wrong. While I am duty-bound to speculate on its appearance as it emerges from the Sun’s glare, no-one knows exactly what if anything we will see. After a disappointing few months, a sudden surge in ISON’s activity and brightness began on 13 November. I glimpsed it through binoculars three days later and it continued to brighten as it dived lower in our south-eastern pre-dawn sky, first passing the star Spica in Virgo and then Mercury, by which time it was near the fourth magnitude and disappearing into the twilight. Since then we have relied mainly on observations from spacecraft. Claims that it may have stopped brightening as the production of gas and dust from its nucleus fell dramatically, and even that the nucleus was already disintegrating, painted a pessimistic picture. However, the mood changed when ISON appeared to be remarkably healthy and intact in the final hours before perihelion. Even if the nucleus does shatter, it may not spell the end of ISON as an interesting object. Its gas and dust has to go somewhere, and that may lead to the comet’s tail remaining visible, and possibly brightly so. Don’t miss any opportunity to look for it stretching almost vertically above our east-south-eastern horizon before dawn over the coming few days, perhaps beginning as early as 1 December. It may also be glimpsed reaching up and to the right from our western horizon after sunset. The comet’s head and nucleus, assuming it survives, tracks almost due northwards in the sky, climbing steeply in the east before dawn and heading to a position halfway between the bright stars Vega and Arcturus on the 21st. Our “Looking North” chart picks up ISON at this point and depicts its progress onwards and upwards into Draco by the year’s end. It is closest to the Earth, 64 million km, on the 26th but will it still be visible at Christmas? Even if ISON fails miserably, our December nights are a treat to behold. They begin with Venus blazing low down between the south and south-west as it sinks from about 10° high at sunset. The planet is at its brilliant best, magnitude -4.7, as it stands 7° below-left of the young Moon on the 5th and 12° below-right of the Moon on the 6th. By Hogmanay it sets 105 minutes after the Sun as seen from Edinburgh and is 59 arcseconds in diameter, near enough (42 million km) and large enough for its slender 4% illuminated crescent to be recognised easily through binoculars, and perhaps by the keenest naked eyes. Our second prominent planet, Jupiter, rises at Edinburgh’s north-eastern horizon at 18:21 GMT on the 1st and only 16 minutes after sunset by the 31st. Conspicuous in the east at our map times, it passes high in the south six hours later and is sinking in the west before dawn. Jupiter lies some 9° below and right of Castor and Pollux in Gemini and is slowly retrograding (tracking westwards) to pass only 0.25° north of the third magnitude star Wasat or Delta Geminorum on the 10th. Telescopically, the Jovian globe swells from 45 to 47 arcseconds as the planet approaches opposition in early January. 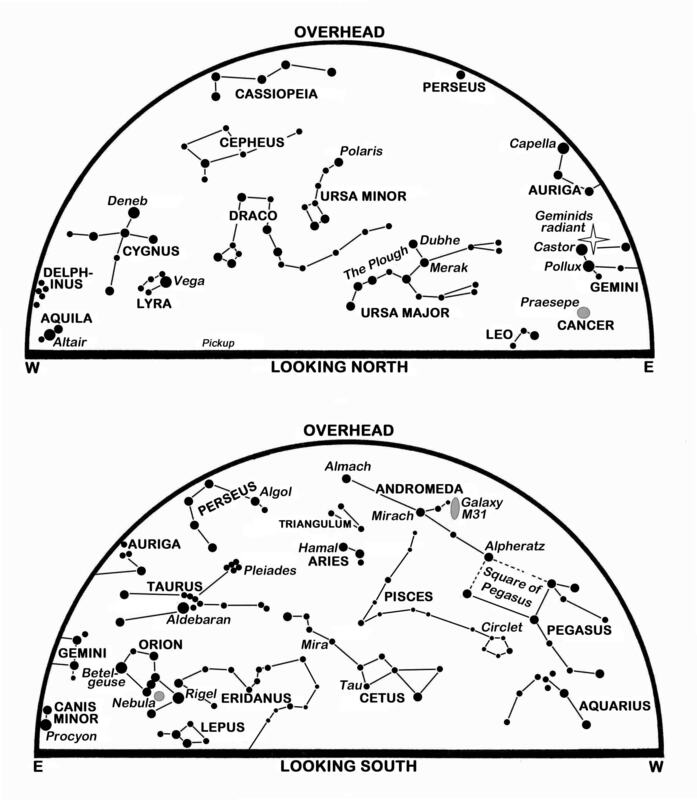 Orion, stands to the south of east at our map times, and is impressive as it climbs to cross the meridian during the midnight hours. 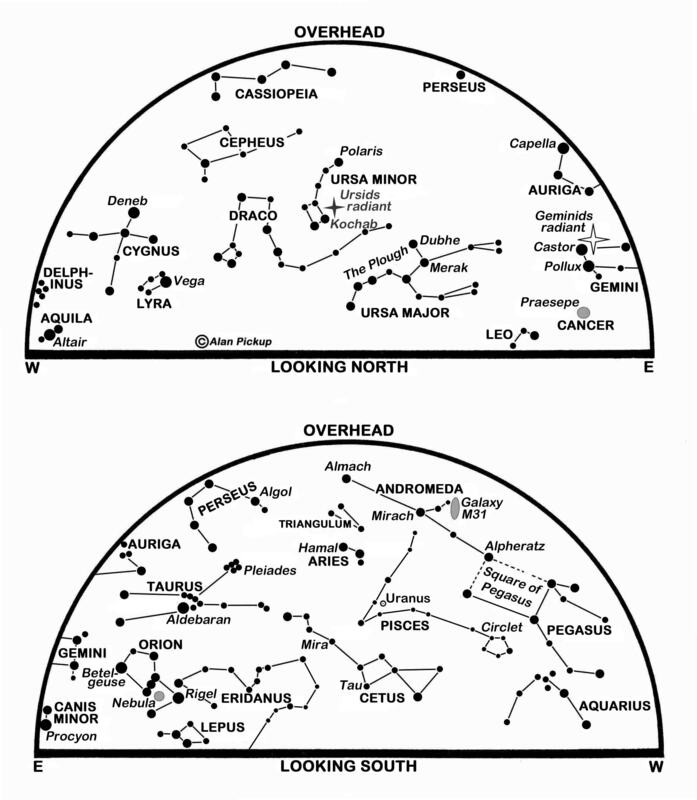 A line upwards along Orion’s Belt extends to Aldebaran and the Pleiades in Taurus. Look for the Moon close to Aldebaran on the night of the 15th and near Jupiter on the 18th. Mars rises in the east at 01:00 on the 1st and 30 minutes earlier on the 31st. Tracking eastwards against the stars of Virgo, it improves from magnitude 1.2 to 0.8 this month as its disk swells from 5.6 to 6.8 arcseconds in diameter – still too small for surface detail to be seen easily through a telescope. Look for Mars above the Moon on Boxing Day morning. Our second morning planet, Saturn, lies in Libra and rises in the east-south-east at about 06:00 at present. By year’s end, though, it rises at 04:20 and shines at magnitude 0.6, making it the brightest object low in the south-east to south before dawn. 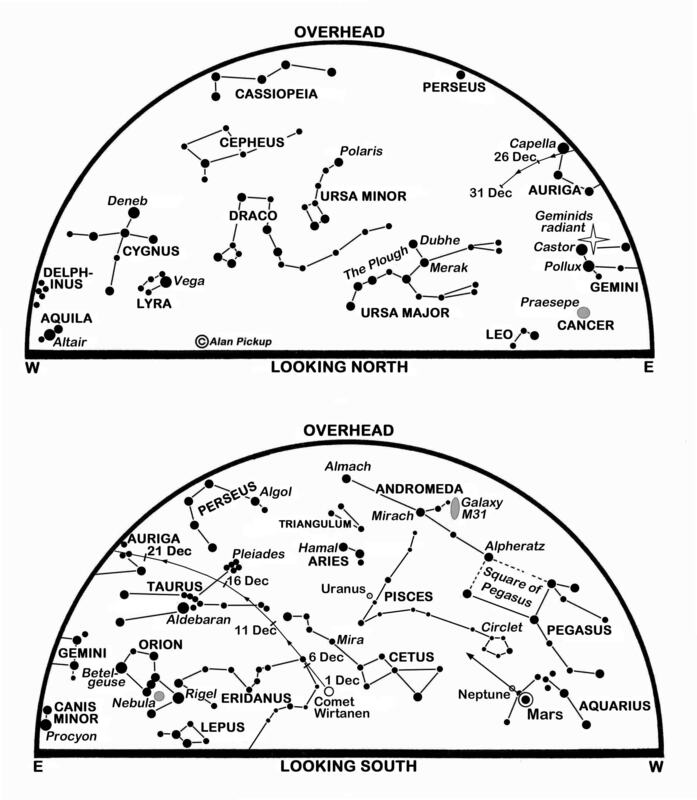 Catch it above-right of the waning Moon on the 29th. Only a few days before the end of its best apparition of 2013, Mercury shines brightly at magnitude -0.7 and stands almost 5° high in the south-east forty minutes before sunrise tomorrow. The annual Geminids meteor shower is active from the 8th to the 17th and is expected to peak in the predawn hours on the 14th. 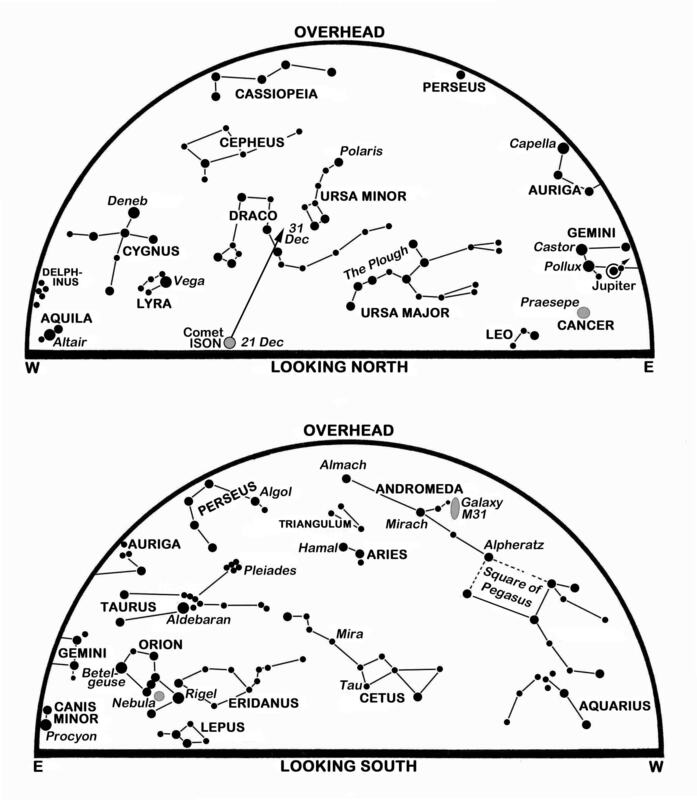 The bright moonlight for most of the night may still allow several slow bright Geminids meteors to be seen as they stream away from a radiant point close to Castor, roughly where the M of GEMINI lies on our north star map. The Sun reaches its most southerly point in our sky at 17:11 GMT on the 31st, marking the winter solstice. Sunrise/sunset times for Edinburgh vary from 08:19/15:44 on the 1st to 08:42/15:40 on the 21st and 08:44/15:48 on the 31st. Nautical twilight persists for about 95 minutes at dawn and dusk. The Moon is new on the 3rd, at first quarter on the 9th, full on the 17th and last quarter on the 25th. This is a slightly-revised version of Alan’s article published in The Scotsman on November 29th 2013, with thanks to the newspaper for permission to republish here.